When taking observations from patients with learning disabilities remember that generalisations may be inappropriate, say Andrea Page and Melanie Wakeman. 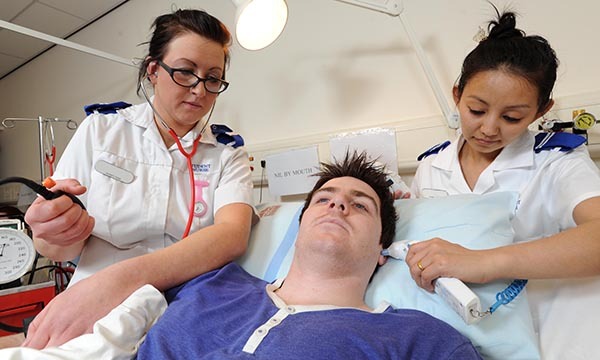 All nursing students are taught a range of core nursing skills in their first year at Birmingham City University. These include nursing observations such as taking manual blood pressure, tympanic temperature and pulse, and assessing an individual’s respiration. The observations enable nursing students to detect changes in the individual’s condition quickly and accurately. They can be reported to mentors on placement so that appropriate actions can be decided. Undertaking nursing observations is a fundamental element of care. Observations should not be taken in isolation, and nursing students need to know the appropriate clinical ranges for their patient population, and child or adult ranges. However, we believe that determining whether findings are ‘normal’ for the age of the individual may be problematic with some patients with a learning disability. The book Physical Health of Adults with Intellectual Disabilities (Prasher and Janicki 2002) has established that ‘much of our knowledge regarding physical health issues in adults with intellectual disabilities is based primarily on generalisations from clinical and research findings on the general population’. Second-year students revisit these skills in a session designed to enable them to synthesise and apply their anatomical and physiological knowledge to learning disability individuals. Yet there is a lack of research on whether profound or multiple learning disabilities affects observation findings. Most textbooks note factors that affect readings, such as posture, exercise and neural mechanisms. But we have found none that consider the potential physiological impact of having a learning disability, and in particular the impact that a profound and multiple learning disability may have on the individual. We explore the following considerations with second-year nursing students to generate further discussions on this issue and with a view to influencing textbooks used as reference materials in future. The discussions centre on whether nurses should take into account the known physical, neurological and health issues during nursing observations. Students can also talk about the issue of health placements versus social care placements and how the majority will rely on GPs to take observations. This means there is often no baseline data taken when the individual is well, and it is questionable to place so much emphasis on the readings being inside or outside the normal clinical ranges as such ranges may be inaccurate for the individual. Observational data obtained by a GP may not consider the potential physiological alterations. It is our belief that learning disability nurses need to become more involved with these processes. In our lesson plans we describe observations of respiration, pulse, temperature and blood pressure, describing these mechanisms and looking at factors that need to be considered when making these observations with patients who have learning disabilities. Table 1 outlines the lesson plan we use for respiration, pulse, blood pressure and temperature, and highlights possible altered physiological considerations. Normal breathing mechanisms and how this can be compromised by distortion of the rib cage. The importance of full ventilation of the lungs and the impact of shallow breathing more likely seen in an individual with PMLD. Possible congenital abnormalities and early onset pathology of the lungs and/or nervous system that may impair normal regulatory mechanisms. The increased incidence of respiratory disease and respiratory failure due to altered brain function. The ageing population with Down’s syndrome are more susceptible to asthma and pneumonia. The impact of medications on the central nervous system, particularly those that depress the respiratory centre. We also discuss how individuals with challenging behaviour and/or those on the autism spectrum may exhibit higher levels of anxiety which may impact on the baseline level. We discuss the ability of the body to respond to the respiratory demands being placed on it in stressful situations. We ask students to consider whether there are variations in respiratory rate, rhythm and depth that relate to the above. If yes, what actions should the nursing student take and why? Who is inactive? Inactivity can predispose individuals to weight gain and circulatory problems, with a resultant effect on pulse. Who may have a distorted body shape and how this may determine the individuals’ ‘normal’ clinical range for pulse. Whether students have been able to assess the pulse of someone with PMLD and factors which may impede on this skill being performed, such as a radial pulse being difficult to undertake due to contractures, on individuals who are cold, or who have poor circulation. Possible congenital abnormalities and early onset pathology of the heart and or nervous system may impair normal regulatory mechanisms. Higher brain functions may be affected due to structural variations and malfunctions resulting in an increased risk of heart disease. Impact of medication on homeostatic regulation. We also discuss with students how individuals with challenging behaviour and/or those on the autism spectrum may exhibit higher levels of anxiety which may impact on the baseline level. We ask the students to consider variations in pulse rate, rhythm and strength that relate to the above. If yes, what actions should the nursing student take and why? Impact of a learning disability on brain function and how this relates to the individual’s ability to conserve or transfer heat. The impact of hypotonia, hypertonia and spasticity on metabolic rate and the individual’s temperature are identified through cases histories. Awareness about malnutrition and the potential impact on metabolism and core temperature. We link this into how difficult it is for people with PMLD to achieve thermal comfort. We ask students to identify what actions they should take and why. The impact of congenital abnormalities of the heart, as seen in Down’s syndrome. Altered neural-hormonal regulation, including renal function, that may affect the long-term regulation of blood pressure. How inactivity can predispose individuals to weight gain and circulatory problems, with a resultant effect on blood pressure. The potential impact of medication on homeostatic regulation of the cardiovascular system. We discuss how to take a BP of someone with contractures or a distorted body shape. Individuals with challenging behaviour and/or those on the autism spectrum may exhibit higher levels of anxiety, which may impact on the baseline BP. We ask students to consider whether there are variations in blood pressure in relation to the above. If yes, what actions should the nursing student take and why. We encourage students to consider the potential variation for each observation. Would they expect the individual clinical observation parameter to be higher, lower or within the normal clinical range? There are no definitive answers, but we emphasise the importance of baseline measurements when the individual is well. We discuss the frequency and duration for recording such observational data. It should be noted that when students identify individuals they have cared for on placement a pseudonym is used to maintain confidentiality. This set of ideas is being implemented in practice by our students who qualify and work within local placements. As educators, we have a responsibility to support the unique situations that learning disability nurses experience with regard to abnormal observational data. On the basis of sharing good practice we would like to invite feedback and further discussion on this subject. Prasher VP, Janicki MP (2002) Physical Health of Adults with Intellectual Disabilities. Blackwell, Oxford.